In every teen movie, you’re bound to witness a moment of naïve experimentation from a character blinded so much by the “what if it works?” that he hasn’t stopped to consider that it might not. Patrick’s courtship of Kat in 10 Things I Hate About You comes from that place of imagined glory, as does Fogel’s fake ‘McLovin’ I.D. in Superbad and, of course, Ferris Bueller assuming he can get away with borrowing a prized Ferrari. The audacity of youth comes from a self-perceived distance from past failures – sure, they might have happened before, but to other, nameless people. And besides, any shame will surely make way for the glory of the next success. Football has such moments too, but they’re often fewer and further between. It’s not due to a lack of self-confidence but rather the higher cost of getting it wrong – which means when someone like Matheus Cunha goes all out, it’s pretty special. Others have achieved the feat, of course, with Federico Macheda’s stunning debut winner for Manchester United and an 18-year-old Michael Owen terrorising the Argentina defence in Saint-Étienne two of the more obvious examples. But both of those players pulled off something broadly within the remit of what a player in their position is expected to do. Nineteen-year-old Matheus Cunha, however, announced himself by doing something he probably shouldn’t have tried, performing such an accomplished version of The Wrong Thing that he was able to turn it into The Right Thing. 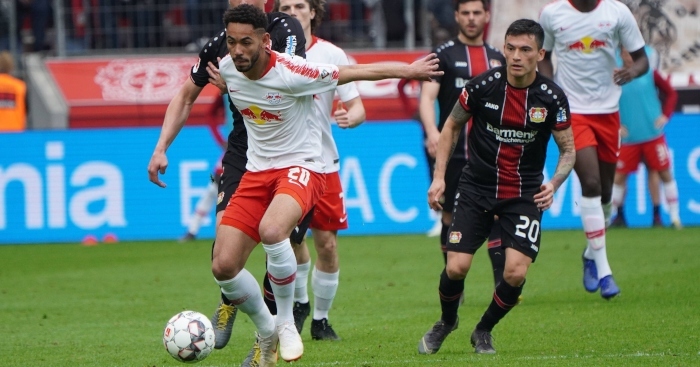 RB Leipzig are on a 10-match, 22-goal unbeaten run in the Bundesliga which has lifted them from fourth and just a point away from dropping out of the Champions League places to third and eight points clear of the team in fifth. Cunha has been involved in nine of those games, starting four, and it was in a 45-minute cameo away to Bayer Leverkusen that the summer signing from Sion decided to make sure we remember what he’s capable of. Before we dissect the move, it feels important to point out that this was a one-goal game before Cunha found the net. Leipzig have come from 1-0 and 2-1 down to lead against a Leverkusen team with Kai Havertz, Leon Bailey and Paulinho all on the pitch in pursuit of an equaliser. This is not just a bit of showboating at 5-0 up: failure to score could prove costly, and therefore the stakes ought to be higher, yet it doesn’t seem that way for a second. As he sees Wendell in his peripheral vision, Cunha has mentally beaten three men: the Brazilian defender, Levekusen goalkeeper Lukáš Hrádecký, and you, the person reading this article. That’s right, you anticipated the pirouette and gave yourself a pat on the back for figuring out what you were about to see before you saw it, only for the Brazilian to hit you with the unexpected. With the dink over Hrádecký, Matheus Cunha has invented football’s post-credits scene: the extra bit of content thrown in at the end purely to remind you it’s something he can do. He knows you’ve already been spoiled by the turn and don’t necessarily deserve more than that, but hey, there are some games where you won’t even get a goal, let alone one of this quality, and he wants to give you something to play back in your head on the rare occasions where entertainment is at a minimum. The chip is as smart as it is dumb, a high-margin play where he’s already bought himself a full month of goodwill with the set-up and decides to trade it in for what’s in the mystery box. It’s as if David Copperfield hadn’t just made the Statue of Liberty disappear but stuck the Eiffel Tower in its place: the beauty comes from the superfluousness. When you’re a teenager, you can either work from the premise that you have all the time in the world to do what you want to do, or that your next chance could be your last. Or, if you’re Matheus Cunha, you realise you have all the time in the world and use that opportunity to attempt everything, be it the turn and chip against Leverkusen of the audacious bicycle kick against Fortuna Dusseldorf back in September which didn’t quite come off. Cunha is Patrick serenading Kat on the bleachers, well aware that – as much as it seems as though the situation will present itself again in the future – things and people can change and there might not be a moment as perfect as this one ever again. His timing might have been slightly off when he made his last approach, but the fact that he kept getting more chances is something he decided to take as a sign. A good player will look back on his career when he retires and think about the trophies he didn’t win. A great one will look back and pinpoint the chances he missed. A true icon, though, will look back at those times he scored a goal which was just good, rather than perfect. When Matheus Cunha hangs up his boots years from now, we doubt the last of these will worry him all that much.